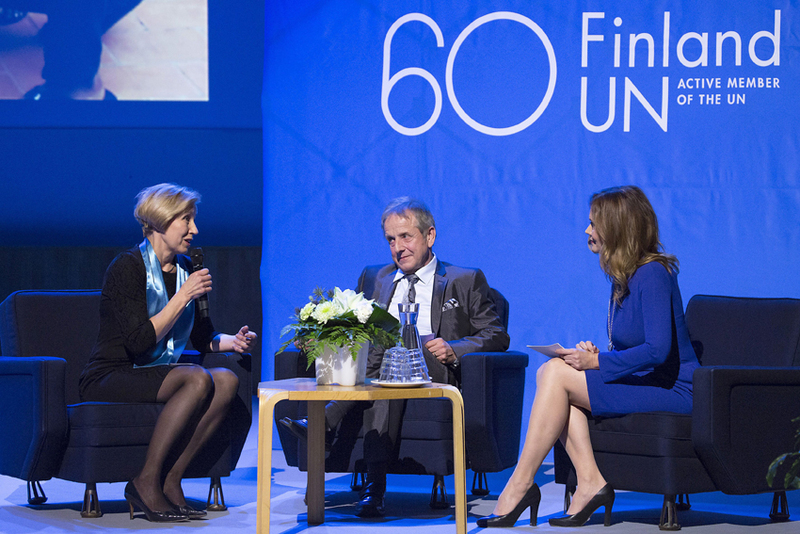 “We need new ways of thinking and new type of development cooperation”, said Executive Director of the Finnish National Committee for UNICEF, Marja-Riitta Ketola at the celebration of Finland´s 60th anniversary in UN. When UNICEF and Biolan presented the UNICEF-Academia-Private Sector project UniWASH at the stage of Finlandia Hall, the UN General-Secretary Ban Ki-Moon gave them the thumbs-up. The project was introduced to Ban Ki-moon and other distinguished guests on 9 December in Helsinki in the celebration of Finland´s 60th anniversary in UN. The project is regarded as a model example of innovative way of doing development cooperation and working together with academia and private sector. In his own speech Ban Ki-moon underlined the importance of development cooperation in prevention of conflicts and terrorism and reminded of the funding needs for long term development work. Through the UniWASH partnership UNICEF is developing creative local solutions to improve the access of Ugandan school children to clean water, sanitation and hygiene in Acholiland, Northern Uganda. The project partners are Makerere University in Uganda, Aalto and Helsinki Universities in Finland as well as six Ugandan small and medium sized companies and Finnish company Biolan. The project is funded by the Ministry for Foreign Affairs of Finland and Finnish National Committee for UNICEF. Executive Director of the Finnish National Committee for UNICEF, Marja-Riitta Ketola highlighted that the project can find more creative and effective solutions through this unique multi-partner model. - The biggest challenges of the world´s children are not going to be solved by just one organization or one group in just one country. We need new ways of thinking and new type of development cooperation to be able to implement the new Sustainable Development Goals. Key role of UNICEF is to ensure that the project supports the National Development Goals of Uganda and that innovations developed together are sustainable and will have long-term impact on the lives of children. The innovative hand washing tap was presented to the audience as one of the jointly developed solutions. It is a hard-wearing tap designed primarily for schools in developing countries. It conserves water and prevents hand re-contamination. It also teaches user the correct amount of time to wash their hands as it signals after 20 seconds that the time is ripe to end your hand wash. Most importantly it reduces time children need to spend on fetching water during school days. - For us a real innovation is the one which has a long term impact on the lives of children and their communities, said Marja-Riitta Ketola. In developing of the hand washing tap, children and their communities have been actively participating both in identifying the problems and developing the solution. - This is extremely important, since children are the best experts of their own lives, Ketola emphasized. In order to create sustainable change, UNICEF considers it important to build the capacity of the local economy. That is why the tap is made from low tech parts and it can be manufactured and further developed by local small and medium size companies, Ms Ketola explained. The Finnish company Biolan, one of the partners, introduced their role in the project. Biolan, which develops sustainable sanitation solutions, has been training and mentoring Ugandan companies in issues such as marketing and product development. Pekka Kariniemi, chairman of the board of Biolan, said he sees the partnership fitting well with the company`s vision. - For 40 years Biolan has been developing sustainable solutions that help to reduce the environmental burden caused by people. It takes time and requires lots of learning to understand how to operate in new markets. With UNICEF and UniWASH project we have a possibility to learn about the operating environment in Uganda and Eastern Africa and together address the severe water and sanitation problems that children face in their everyday lives in Uganda.